Awestruck, the fastest growing digital entertainment brand for millennial moms, announced today that all episodes of their first scripted series, Confess, will premiere on go90 on Tuesday, April 4th. 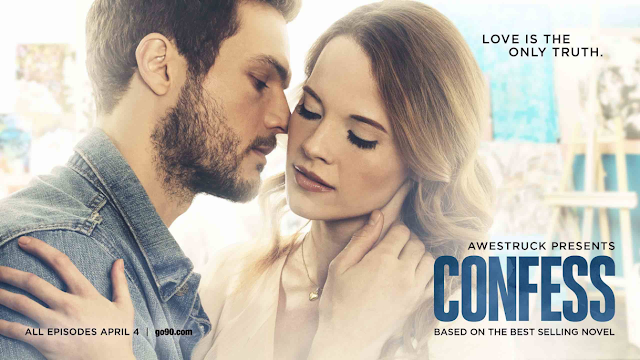 Confess is based on the novel from #1 New York Times bestselling author Colleen Hoover and was the winner of the Goodreads® Choice Award for Best Romance Novel of 2015. “We are really excited to bring this highly anticipated adaptation of Colleen's beloved novel to go90,” said Ivana Kirkbride, Chief Content Officer at go90. “The premiere of Confess is the perfect complement to our vast collection of AwesomenessTV scripted originals and is sure to delight Awestruck and Confess fans alike." Confess is a modern love story about the secrets we keep to protect the ones we love. Auburn Reed, played by Switched at Birth’s Katie Leclerc, is determined to put her challenging past behind her and get her future on track. Now in her mid-twenties and struggling to fund her custody battle for her only son, she stumbles upon the art studio of the talented and charming artist, Owen Gentry, played by Ryan Cooper. The two wrestle with their developing romance and the secrets they’re both keeping until they realize they may risk their future if they don’t reveal their pasts to each other. Will they confess, and can their love survive the truth? Acclaimed actress Sherilyn Fenn, known for Shameless, Ray Donovan, and her iconic role as Audrey Horne in the original Twin Peaks and the upcoming 2017 reboot, will appear as Lydia. Rounding out the cast is prominent DJ & influencer Amy Pham as Emory, actress and notable social media influencer, Brittany Furlan, as Hannah, and Rocky Myers as Trey. Confess is adapted for the screen and directed by Elissa Down. Executive Producers include Lauren Levine, Colleen Hoover, Amy Kim and Jamie Burke (Lifeboat Productions), Brian Robbins, Brett Bouttier, and Lisa Berger. go90 is currently delivering over 500 hours of exclusive original series from some of the industry’s most talented and interesting studios and creators. Confess, the novel, is published by Atria Books and a special media tie-in edition is available for purchase now.